This statistic depicts recoveries paid and expenditures spent regarding fraud cases under Medicaid in FY 2017, by type. 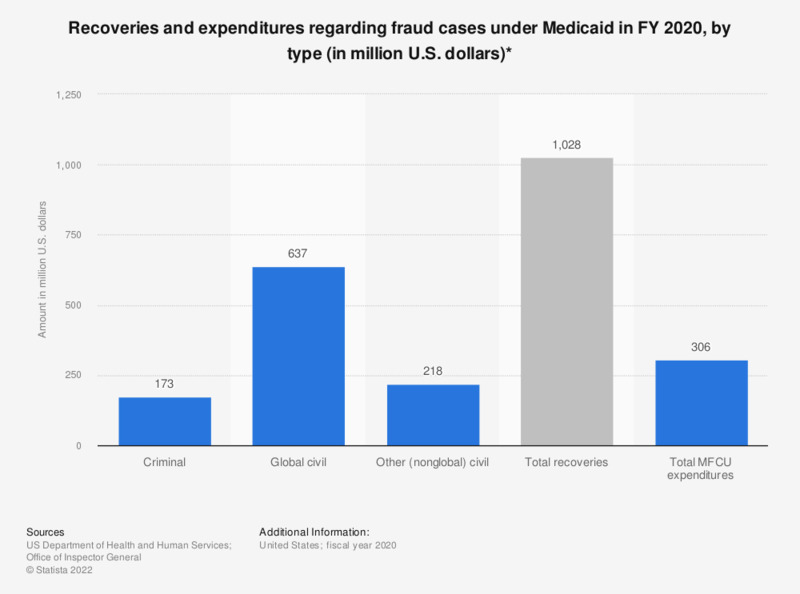 During FY 2016, global civil recoveries from settlements and judgments regarding Medicaid fraud, abuse, and neglect cases amounted to some 343 million U.S. dollars. * Including fraud, abuse, and neglect cases. Recoveries are defined as the amount of money that defendants are required to pay as a result of a settlement, judgment, or prefiling settlement in criminal and civil cases and may not reflect actual collections. Recoveries may involve cases that include participation by other Federal and State agencies. “Global” recoveries derive from civil settlements or judgments involving the U.S. Department of Justice and a group of State MFCUs and are facilitated by the National Association of Medicaid Fraud Control Units. MFCU and Medicaid Expenditures include both State and Federal expenditures. MFCU = Medicaid Fraud Control Units.